At the start of the 2014 when we had the pleasure and good fortune of seeing Kim Wilson in San Jose, there was rumour he would be playing new Rocket harps for the show, in advance of their official release date. Contrary to speculation however, he didn’t. Nevertheless, here’s a short video of Kim trialling the Rocket at the 2014 NAMM exhibition. Note the in-store display stand behind Kim in the video, which demonstrates Hohner’s new eco-friendly display packaging. Hohner really has got its act together here, although the actual instrument, now in a standard black neoprene zip case, only takes up one third of the box’s interior. 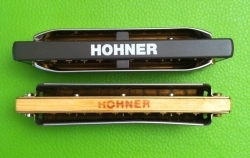 The bulky packaging allows Hohner more space for marketing on the exterior of course. And as if by compensation, they slip in a free, slim-line pocket guide, which is crammed with some very good harping information. On Hohner’s official website and on YouTube, you will find videos by Howard Levy, Steve Baker and Ron Shellist, amongst others, extolling the virtues of the new Rocket. Pat Missin has also written a comprehensive review in the June 2014 issue of Harmonica World magazine, which is available through the UK’s National Harmonica League (NHL). Hopefully the Good Doctor’s analysis will add an extra angle to things. The Rocket is the latest addition to Hohner’s Progressive Series (Rocket, Special 20, Golden Melody) and has a UK RRP of £44.99 (inc VAT). It’s not cheap! Price wise, this sets it above its stable mates, the Golden Melody and Special 20, both of which sell at around £31.99. In contrast however, a Crossover Harp from Hohner’s Marine Band series fetches £59.99. 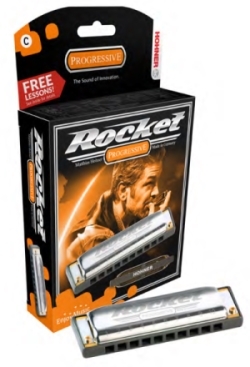 Meanwhile, the Rocket is £20.00 more than Hohner’s MS Series Big River or Enthusiast Series Blues Bender. All of which suggests Hohner have been particularly strategic in their costing and retail planning. So what do you get for your extra financial outlay? 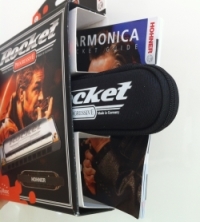 Well, according to Hohner’s marketing blurb, the Rocket constitutes a new breakthrough in harmonica design. They claim it’s also more comfortable than other harps and it plays louder. Which all sounds great, until we find the reed plates are standard 0.9mm gauge and the reeds themselves are made from standard brass. So where’s this breakthrough? The Rocket’s comb is made from ABS plastic too, which again is nothing new. However this is where the new developments begin. The comb has been ergonomically modified and with its attractive matt, slate grey finish and rounded corners, it’s been built for comfort. So the first of Hohner’s unique selling points – Comfortable, Responsive and LOUD! – definitely holds up. But this is only a part of the overall breakthrough; by itself, the new comb is simply an overdue update. Nevertheless, it is very attractive and it does feel lovely. Indeed, to the eye, it’s what initially sets the Rocket apart from, if not ahead of, other short harps. The Rocket’s cover plates are also a departure from the norm. When you first remove the harp from it’s zip-case, you’ll immediately notice the cover plates are attached by just two Phillips screws, which sit at the forward edge of the harp. This might be an idea Hohner have borrowed from Suzuki’s Manji (above left). Again, it doesn’t constitute a major breakthrough in isolation. In fact it’s probably a useful production cost saver, but it does look smart. 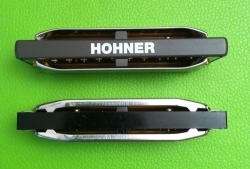 More significantly, with the stainless steel cover plates morphed from their own Special 20 model, Hohner have opened up the Rocket’s side vents to maximum possible specification; even more so than their Marine Band series. For you to get a clear idea, here’s an image of a Rocket, Crossover and Special 20 (l to r), end on for comparison. Compared to the comb and leading reed plate edges that constitute the playing surface of a Crossover, the Rocket’s comb stands a good 1mm prouder at the front. 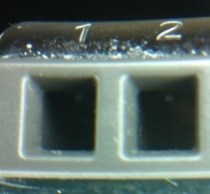 This means the cover plates are also deeper (1.5mm) front to back than the Marine Band series. Consequently, the Rocket has enough space to cut side vents that are 3mm longer than on other leading models. A sceptic might say that’s even more production metal saved, but it definitely opens things up for a louder delivery when played acoustically. So together, the comb and cover plates are an important part of the overall new breakthrough, though still by no means the whole picture. With enlarged end vents, the Rocket is perceptibly louder than other vented models. It’s like pulling the front off your upright piano, which supports another of the Rocket’s USPs. But beware, as far as the dynamics of a humble mouth harp are concerned, the extra noise space also compromises depth of tone. If you block the end vents with your fingers while you’re playing and compare the result with the Rocket’s open sound, you’ll notice a much warmer result. The difference is clear. Some players tape their vents from inside the cover plates to block out this feature, especially for amplified playing. It’s a question of personal taste. 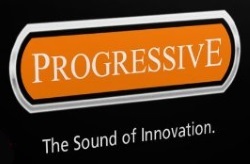 All we’ll say is you may prefer a warmer tone directed at your audience, than extra decibels ringing in your own ears. End to end, the Rocket is the same length as the Crossover at a standard 10cm, however it has a chunkier feel, more reminiscent of a Big River. This is because the face of the comb stands a good 2mm taller than a Crossover or Special 20 and is a good 4mm deeper from front to back. All of which gives you more blues burger to chomp. Which is good. Inside the harp, the reed plates are recessed into the comb and held in place with no less than 8 internal screws. This makes the performance of the Rocket extremely airtight. This is the penultimate step in Hohner’s design breakthrough; it’s very responsive. The Rocket’s nearest relative, the Special 20, has 6 internal screws and recessed plates. 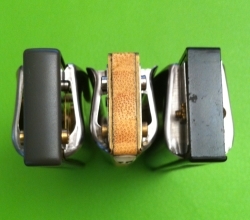 By comparison the Marine Band Series have just 3 internal screws and the reed plates are not recessed. And by the way, we noted also that the Rocket’s reed plates and comb actually have two extra screw holes at each end, which do not feature on the cover plates. You can see them quite clearly in the image above. 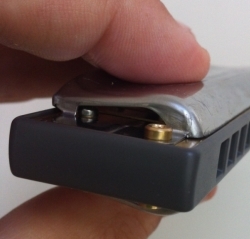 Presumably the plates are mass-produced for use in different models, but this feature also facilitates customisation of the cover plates, should anyone decide to add extra screws. We mentioned that the Rocket is bulkier than the Special 20 and Marine Band Series harps. It is however sleeker than the Big River. Its ergonomic comb and open cover plates, tapering at each end, give it a streamline appearance from the back. To the right we can see the Rocket (above) and the Special 20 (below) from behind. Add to this two central support tabs and the Rocket’s cover plates are far more sturdy than you might imagine. A drawback we found with the Crossover’s design is that, without similar central supports, it’s cover plates can start to sag in the middle. This is quite noticeable in the image to the left, where we can see a brand new Rocket (above) and a battle-worn Crossover (below). Returning to the airtight aspect of the Rocket for a moment, there is one final feature that completes Hohner’s design breakthrough. The Rocket’s channel openings are a millimetre bigger than standard models. They also narrow as you look into the harp and this means the airflow through the Rocket is effectively ‘turbo-charged’. In the grander scheme of things, we’re talking barely a millimetre’s depth to the taper, but an experienced player will notice the difference. And this is the finishing touch to a creditable step forward in harp design. The channel openings, airtight assembly and ergonomics lend ample weight, if not volume, to Hohner’s marketing strap line, The Sound of Innovation. You’re probably thinking by now this design stuff is all well and good, but how does the Rocket actually perform? Well, we’ve road tested it for almost three months now to make absolutely sure we know what we’re dealing with, and the rocket really has become a pocket companion. It’s travelled three continents, it’s been gigged, it’s been dropped and it’s had some serious workouts. The good news is, it has weathered our testing without any faults, problems or deterioration in performance. It octaves nicely, the support chords are solid and it’s lost none of its voice. The Rocket produces a clear sound with brightness of tone and great presence. We wouldn’t say the tone is as warm as a Marine Band Series harp, but it has all the character and clarity you could wish for. The Rocket is air tight, it is responsive and it is loud. Whether the latter is of any consequence to those who regularly mic up however, is open to debate. Out of the box, you’d certainly find the Rocket is a useful instrument for belting out harp lines in an acoustic ensemble, or for busking. Excuse the pun, but the Rocket is essentially designed as a rock harp. Which may be why we detected marginally wider gapping than normal on the reeds. It invites power-harping. But contrary to the packaging chart (above), it is perfectly capable of delivering blues, jazz, country and other contemporary styles too, with overbends. The Rocket is available in all twelve major keys. 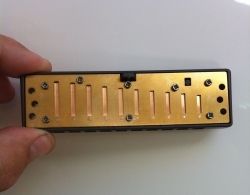 Hohner have kindly stamped the keys on the short end of the Harp for easy storage and swifter identification on stage. If you’re technically minded, or curious, a complete tuning chart is available on the official Hohner website and, with acknowledgement to Pat Missin for the information, the Rocket comes in a light compromise temperament of around AA=443Hz, which is on a par with Hohner’s Marine Band Series. For the record, Hohner say the Rocket is Made in Germany; whether or not this means it’s assembled in Trossingen from parts manufactured in China , we’re not entirely sure. Does this actually matter? Probably not. But to close, there is one final detail from the Rocket’s packaging that cannot go unmentioned. 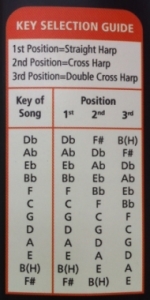 3rd position is listed as Double Cross Harp. (above right). We’ve heard occasional mention of slant harp, and we know about Dorian Mode and minor harp positions, but we’ve never heard of Double Cross Harp. Perhaps, like the Rocket, this will soon catch on! I enjoyed reading your Rocket review. A couple of points I’d like to mention: The cover screw configuration stems from Joe Filisko; all his custom harps from the mid 90s onwards have this feature (previous to that he positioned the screws in the middle). 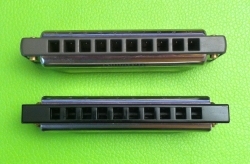 In the course of the development of the Marine Band Deluxe, I persuaded Hohner to produce the prototypes with single cover screws at the front on each side. Shortly before it went into production however, the decision was taken to use four screws, partly for reasons of symmetry, but also on the grounds that people might regard the new development as an imitation of Joe Filisko’s work. This configuration was later retained for the Crossover in 2009. That same year, Suzuki brought out the Manji and adopted Joe’s idea! Hohner have now gotten around to using this method with the Rocket, although I’ve been suggesting it for almost 10 years. There’s a considerable advantage if you need to take your harps apart, having only two screws makes this much quicker and easier. I’ve always removed the back pair of screws from my own MB Deluxes and Crossovers, as they serve no purpose in my view; I now have a large collection of spares! There is a chance the back edge of the lugs will lift off the plate slightly when affixed with single screws at the front, but in my experience this has no bearing on performance. The expression “doublecrossed” for 3rd position is quite old, I first heard it from Have Mercy founder Chris Turner in the early 1970s and I used it in The Harp Handbook. We used to refer to the first 3 positions as “straight”, “crossed” and “doublecrossed”. That’s why my tune is called “Doublecrossed & Blue”! Good review. As with all of Hohner’s design “breakthroughs”, they leave me wondering why the **** they don’t just build these long overdue feature-upgrades into their existing designs? Like you said, market segmentation. Great to hear from you Mr Murray! I can only imagine there are a host of factors behind these kind of developments, including trialling, board room battling, resourcing, costing and marketing, all of which delay the light bulb to sales room process. And then Hohner need to let the new ideas bed in before they migrate ideas into other existing models. Or not, if this means any costs increase cannot be offset by economies of scale. It does seem to me that their pricing of the Rocket is very strategic. I like the fact that Hohner has opted for colour-coded Series of models also. This makes sense and it’s very cool. Some explanation of how they categorise the style of music making suitable for each harp would be interesting however. According to the box, the Rocket is definitely NOT designed for blues playing, it’s for Rock and Pop harping. Oh and for Speciality harping, whatever that means. Yet you and I both know what most players will actually use it for.. I already do! This is something I also called into question in the review. Hohner has categorised it’s harps into ‘Series’. You can play blues on a Rocket. Of course you can – it’s a 10 hole diatonic the same as the rest of them. I just suspect that Hohner feels it’s more suited to other styles, stating Pop & Rock and Specialty on the packaging. Pop & Rock will most likely be because it is loud and will withstand power harping activity. By the same token, it may lack some of the timbre and tone that a wooden bodied harp will bring to the blues table. And yet other reviews I’ve read suggest it’d stand up well for acoustic playing…including blues. But Specialty? This could mean playing in the bath tub for all we know. The Rocket has no sprues so it works for performing of the blues; Hohner might eventually update that chart. The sprues are the plastic tabs connecting parts of the comb on the standard Special 20 and Golden Melody; those sprues can interfere with bending and thus interfere with performing of the blues. Professionals often remove the sprues as part of the process of customizing of their harps. I have a question, will the coverplates of a Rocket fit on a special 20? Hi Tim. Possibly, but I don’t have a Special 20 so I can’t say for certain. The Rocket of course only has two screw heads, so even if the over all size fits, it might involve some drilling to match the screw holes. My question is why do you want to swap the cover plates?